A vertical depicting astounding growth trends like few others perhaps, vacuum pump industry, despite having proved itself as one of the profitable business spheres, is still largely underrated among its peers in the global HVAC cosmos. Endowed with a vast application landscape, ranging from the medical domain to power plants and the food processing sector to heavy product manufacturing, vacuum pump market has time and again proved its mettle. Industrial vacuum pump manufacturers, in essence, have been tirelessly striving to expand the popularity of this vertical, and have lately met with immense success, impelling this business space further. The sole purpose of using a vacuum pump is to let out gases and air from sealed spaces for maintaining the requirement of the application in question. For instance, vacuum pump systems are liberally used across the pharmaceutical and chemical industries to handle hazardous chemicals that might prove disastrous to the health of workers in case of a leakage. To combat problems of this nature, regulatory bodies have been persuading end-use industries to deploy vacuum pump systems at their workplace. An instance validating the contribution of regulatory organizations is that of the Occupational Safety and Health Administration (OSHA) having framed new rules in 2016 to control the exposure of silica dust which may cause respiratory issues to the working personnel. As per estimates by OSHA, in the U.S. alone, more than 2 million workers are potentially exposed to crystalline silica dust, among which approximately more than 85% workers employed in the construction industry. Technically speaking, there are a plethora of vacuum pump system technologies that have been developed so far for myriad applications, out of which positive displacement pumps have attained quite some popularity. These products are used extensively across the industrial sectors including pharmaceutical, chemical, food processing, oil & gas, and power generation. The high pumping capacity, durability, and energy saving capability of this vacuum pump system have been prompting the deployment of these products on a substantially large scale. Incidentally, positive displacement vacuum pump systems are used by pharma companies for performing tasks such as drying, recreations, distillations, evaporation, sublimation, and degassing. The supremacy of this technology lies in the fact that it helps to control chemical reactions by maintaining the temperature required for performing chain reactions. Consequently, its escalating demand has led to its acceptance across several end-use sectors, that would inherently propel vacuum pump industry trends over the years ahead. In order to consolidate their stance in vacuum pump industry, renowned industrial vacuum pump manufactures have been working to launch high performance and efficient vacuum pumps for undertaking a slew of operations inclusive of degassing, solvent recovery, and drying. Validating the aforementioned fact, a year before, one of the leading giants in vacuum pump industry, Atlas Copco developed a liquid ring vacuum pump which could be used in challenging environments across the petrochemical, textiles, pharmaceuticals, cement, and plastics sectors. Highly suitable for industrial processes such as dewatering, filtration, and degassing, the product generated waves of anticipation in vacuum pump market post its launch. The expansion of the chemical industry and the oil refining market has a pivotal role to play in growth of vacuum pump industry. Oil refineries have lately been adopting advanced technologies to enhance their production methodologies, the impact of which has been experienced through the rising requirement of vacuum pump systems across this sector. Recently, the Russia-based privately held oil refinery, JSC Antipinsky Refinery successfully expanded the capacity of its ARDCU (atmosphere residue deep conversion unit). The modernization of ARDCU comprised the usage of vacuum distillation units (VDU) that helped improve the feedstock processing capacity of VDU from 375 tons/hr to 540 tons/hr. The instance validates that the prominent deployment of advanced vacuum distillation units for isomerization and catalyst regeneration across oil refineries is slated to have a transformational impact on positive displacement vacuum pump market trends. With the increasing establishment of new plants across the chemical sector, industrial vacuum pump manufacturers have been fortunate enough to tap novel opportunities and exploit their existing technology portfolio. The extensive need to deal with sensitive chemicals during distillation processes for avoiding the chances of any hazards has been encouraging end-users to install positive displacement vacuum pump systems on a large scale. A few months before, the German solvent recycling expert, OFRU launched a new recycling plant where it deployed a high performance vacuum pump system with which it could perform distillation processes to extract impurities and liquids from the solvent. As of now, many industrial vacuum pump manufacturers have been developing a new range of these products for maintaining reliability and robustness across the pharmaceutical, chemical, and other end-use domains. Additionally, the overall chemical market, by the end of 2025, is anticipated to be find its way well into the trillion-dollar business spectrum, thereby generating further growth opportunities for industrial vacuum pump manufacturers. Over the last few years, with the unending demand for smartphones and other electronic components, the requirement of vacuum pumps has been invariably growing across the chip manufacturing industry. While manufacturing computer chips, it is overtly mandatory to maintain cleanliness at the workplace, on the grounds of which chip manufacturers have been increasingly deploying vacuum pumps. It has been observed that the overall productivity at manufacturing sites has depicted quite some improvement post the deployment of advanced vacuum pump systems. Big shots like Pfeiffer and Atlas Copco have been remarkably proactive in this regard, contributing to vacuum pump industry with their constant research and development activities. For instance, Pfeiffer invented turbomolecular, high and ultra-high vacuum pumps which could prove beneficial for the semiconductor and coating industries. Speaking along the same lines, Pfeiffer Vacuum Technology AG, in 2017, acquired the U.S. based Nor-Cal Products Inc., which manufactures vacuum components, valves, and chambers that could be used in the fields of coating, semiconductors, and other research facilities. The merger catapulted Pfeiffer ahead of its peers in U.S. vacuum pump industry, making it one of the leading industrial vacuum pump manufacturers across the country. The acquisition is remnant of the fact that prominent magnates across vacuum pumps industry will continue to partake in such M&As and similar growth strategies to come up with unique, efficient, and advanced products, the sales of which are likely to usher in better growth prospects for industrial vacuum pump manufacturers. All in all, it is rather overt that the ongoing trends of sustainability and cost-effectiveness has led prominent industrial vacuum pump manufacturers to conduct in-depth research and development programs in addition to adopting several other growth tactics. 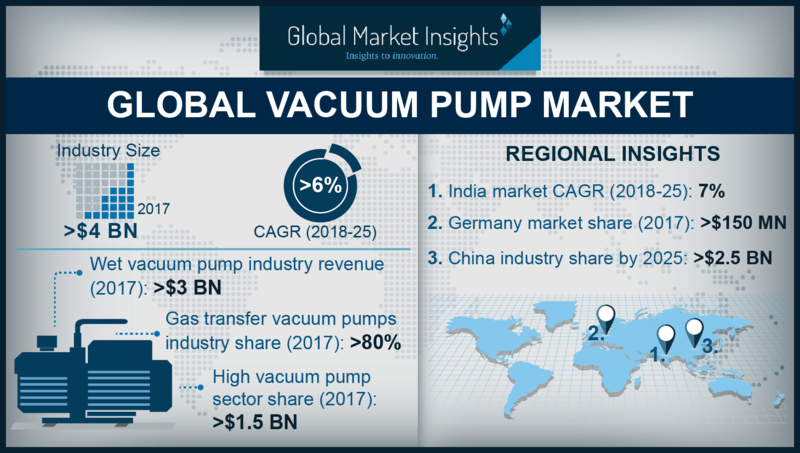 The ever-rising proliferation of these products across end-use sectors such as consumer electronics, oil & gas, and chemicals has been generating lucrative opportunities for the players in vacuum pump market. Having recognized the escalating demand for these products worldwide, leading industrial vacuum pump manufacturers have been working to expand their reach across the developed as well as emerging economies. That said, the advent of technological advancements in vacuum pump design and development also has a major role to play in augmenting the scope of vacuum pump industry. Powered by the efforts of prominent industry contenders in tandem with the ever-growing demand for these products across a vast application expanse, vacuum pump industry size is anticipated to cross USD 6.5 billion by 2025.